CarGurus has 1,223 nationwide QX56 listings starting at $3,995. Coming off a redesign only 2 years ago, the 2013 Infiniti QX56 remains virtually the same vehicle that was sold at dealerships last year. The only changes for the new model year include the addition of auto-dimming exterior mirrors and the around-view monitoring system—with a front and rear sonar system—as standard features. Two trims are available for buyers of the 4-door, 8-passenger 2013 Infiniti QX56: a rear-wheel-drive base trim and a 4-wheel-drive trim. Each comes equipped with a 5.6-liter 32-valve DOHC direct-injected gasoline V8 aluminum block engine and a 7-speed automatic transmission with adaptive shift control, manual shift mode and snow and tow modes. The engine reaches 400 hp and 413 lb-ft of torque, and the QX56 is capable of towing up to 8,500 pounds. The EPA estimates the QX56 can achieve 14 mpg city/20 highway. Standard key features available for both 2013 Infiniti QX56 trims include a tri-zone automatic temperature control system, cruise control with steering-wheel-mounted switches, power-sliding tinted glass moonroof, push-button ignition system, leather-trimmed steering wheel and gear shift knob, heated steering wheel, leather-appointed seating, heated 10-way power driver’s seat and 8-way front passenger seat, dual occupant memory system for driver’s seat, steering wheel, and exterior mirrors, a 13-speaker Bose premium audio system, hard-drive-based navigation system, Bluetooth hands-free phone system, automatic HID bifunctional xenon headlights, power rear liftgate, roof rails and 20-inch forked 7-spoke aluminum alloy wheels. Optional equipment and packages available for the 2013 Infiniti QX56 include the Theatre Package, which adds two 7-inch color monitors for multimedia video playback, wireless headphones and remote, and heated second-row seats; the Tire and Wheel Package, which upgrades the wheels to 22-inch 9-spoke forged aluminum alloy wheels with all-season tires; and the Deluxe Touring Package, which features climate-controlled front seats, a 15-speaker Bose Surround Sound system with digital 5.1 decoding, semi-aniline leather seating surfaces and an advanced climate control system. Numerous safety features can be found on the 2013 Infiniti QX56, including the Infiniti advanced airbag system—dual-stage front supplemental airbags, side-impact supplemental airbags, and roof-mounted curtain side-impact supplemental airbags—plus 4-wheel, 4-channel ventilated disc brakes with an antilock braking system with electronic brakeforce distribution and brake assist, a rollover sensor, traction control, around-view monitoring system and fog lights. A set of options called the Technology Package, with intelligent cruise control, lane-departure warning, distance control assist, intelligent brake assist with forward collision warning and blind-spot-warning and blind-spot-intervention systems, is offered as a safety upgrade. Current owners of the 2013 Infiniti QX56 note the vehicle handles remarkably well for a full-size SUV. Its responsive V8 engine, owners write, delivers more than enough power to the wheels when asked and does especially well when hauling and towing. The ride is deemed extremely comfortable, and the QX56 handles corners remarkably well, too. There are a lot of big-name vehicle manufacturers competing in the large luxury SUV market where the 2013 Infiniti QX56 finds itself, including the Cadillac Escalade, Land Rover Range Rover, Mercedes-Benz GL-Class and Toyota Land Cruiser. The QX56 finds itself just a notch below the bigger names when it comes to luxurious appointments, but makes up for it with rigid construction, making it one of the best choices in the class for going off-road. A little less pricey than its German and American counterparts, the QX56 is a solid contender in the large luxury SUV market. What's your take on the 2013 INFINITI QX56? 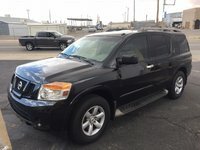 Gary I Look forward to; be a QX56 4 Wheel-drive Owner within 2 year's.... I'm Very Impressed w/ the Leg/ head room& On Board Factory feature's it has on the AWD model. It would be, a Wise choice when Traveling to FL. On some Occasions& I need a SUV w/ Total Worry- free Hassel like the INFINITI Provides.. I'm sure the 2013 QX56 will look AWESOME next to my 13' G37 Sedan. 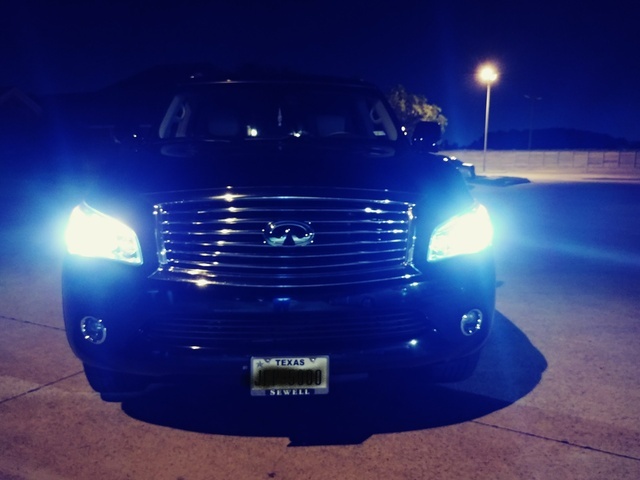 They are very Impressive Reliable Vehicles Local/ Travel Wise... Gary S.
Have you driven a 2013 INFINITI QX56?